Have you been waiting for an opportunity to take charge of a political campaign, basking in the glory of a victory after spending unrealistic amounts of time giving empty speeches to the same dinner halls every day of the week, paying good American money for sketchily produced negative ads, and cashing in all the political capital you have so that you no longer have any sliver of soul left in the tired husk of your body as you sit down in the office chair in the White House? OK, so maybe no one is really looking for that. 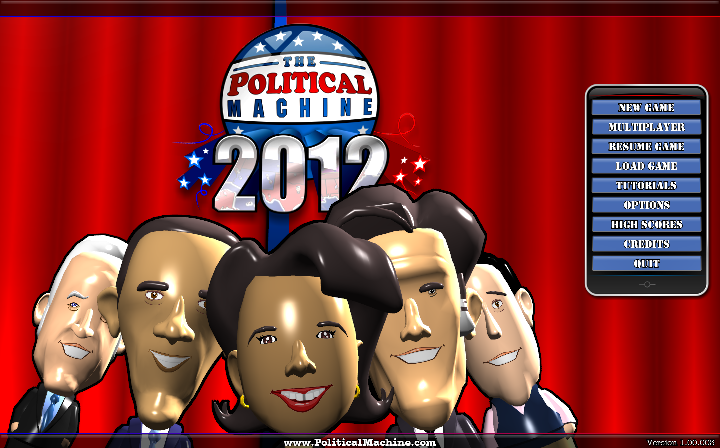 But if you want a simulation of a strategic computer game that will have a full campaign over in about twenty minutes, then Political Machine 2012 is the game for you. Political Machine 2012, produced by Stardock, pits two real-life politicians against each other in a race for the Presidency. It is a casual game, which means the strategy is fairly light and the game playing time is 20-30 minutes. The game plays much like a board game--you move pieces around the board, so to speak--but there's all kinds of minute calculations going on behind the scenes, so it could not realistically be played as a board game. (Board game enthusiasts, of course, would feel pretty much at home.) 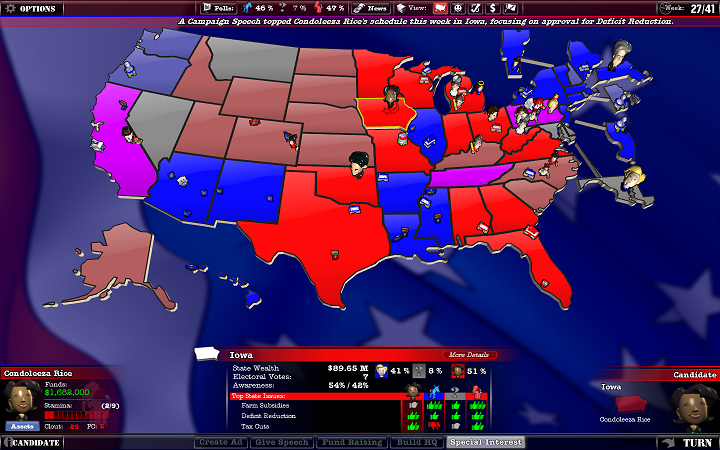 The goal--as in real life--is to win 270 electoral votes. 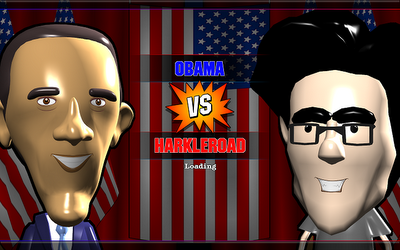 The game presentation is not particularly serious; all of the candidates are represented as cartoonish bobbleheads. While some of the caricatures aren't very good, it otherwise ends up working fairly well given the interface in the game--it looks nicer sliding a bobblehead around a map rather than watching Newt Gingrich walk around. Still, it may put off some people thinking that this game won't be very deep. Players begin by selecting a difficulty and game length, and then (most importantly) a candidate. The roster of candidates represent all of the major players, from Mitt Romney and Barack Obama down to Dennis Kuchinich, Nancy Pelosi, Donald Trump, and Herman Cain. Each politician has eight attributes rated on a scale from 1 to 10, such as Experience (which lets you get endorsements quicker) and Charisma (which makes Ads and Speeches more effective). Each politician also can have stances on various issues, which gives them more popularity in states that are concerned about it. A politician who is a strong supporter of Social Security, for example, will get a bonus in Florida. Once the candidates are selected, play begins. Players have seven main options: flying to a new state, building a headquarters in a state, fundraise, create advertisement, give a speech, secure an endorsement, and hire staff. Players gain support by increasing their awareness, and then getting support by talking about the issues that concern that state the most. For the most part, a player must be in a state in order to take any actions there, but even just merely visiting a state will increase your awareness. You can build one of three types of Headquarters, each of which is expensive, but has varied benefits: some allow you to gain access to more issues in a state, one allows you to hire staff, and one allows you to get endorsements. Each also provides some small benefit, such as increased awareness or income. These can also be upgraded at an increased cost, but with greater effect. Creating an ad and giving speeches will increase voter's support for you. Each must be tailored to a specific issue, so you could give a speech on Reducing the Deficit and those voters who are concerned about it will come to your side. (Each state, of course, is concerned about different issues.) Speeches are free but are limited to that state, while ads are recurring and remain in that state after you leave, but cost money. Ads can be newspaper, radio, and TV, each with increasing visibility (and increasing cost). There are several types of staff members (called Operatives in the game). Staff can be moved from state to state as needed, although three staff members are one-time purchases. Some reduce your own ad costs, for example, or reduces your opponent's awareness in that state. Endorsements are one-time purchases that shift the entire nation towards you based on their issues; the Environmentalist's Club, for example, will grant you a bonus for Alternative Energy and the Environment. (All endorsements are easier for one party to get over the other. The gun lobby is easier for the Republicans to get, for instance.) Finally, Fundraising grants you money, the amount of money collected based on the relative wealth of the state you're in. Other opportunities abound: you are occasionally invited to interviews, which usually work in your favor but could also be catastrophic. Random events will grant you some bonus (including unique Operatives you can't normally hire) or waster your time and money. You also get to pick a vice president at the halfway mark, who you can move around and get awareness bonuses. Each candidate has a certain amount of Stamina. All actions (except Endorsements and Operatives) cost at least one point of Stamina, usually much more. You can keep taking as many actions as you wish until you run out. Even if you don't--say you have one point of Stamina left but can't spend it--no worries; once you accumulate enough "rest" your maximum Stamina increases, so it's not necessarily wasted. Most actions also cost money, which requires a Fundraise action to replenish if you run out. Finally, of course, is election day. States will go your way if you've accumulated more support than your opponent in that state. In a purposefully dramatic electoral map display, it will move from state to state showing the winner, and once one passes 270 they win! In the battle of Condi vs. Hillary, it appears that Tennessee is a swing state. That can't be good. *It's quick, fairly easy, and--bottom line--quite fun. If you follow politics at all (and even if you don't), pretty much everything is intuitive. We all know how advertising works. We all know how giving speeches work. There is a lot of information people can work with, but you really only need to know the basics. *While it's simple, it's got a surprising amount of depth. As you work specific issues, they become less effective, and you'll soon find out that you've run out of easy issues. For example, there's never a reason not to be against Rising Gas Prices, since all voters love to hear it. But after the third or fourth time you pound away at it, voters start to lose interest...so you move to, say, Bank Bailouts, which everyone hates. Then they get tired of that. And so on, until you realize that the only issues left are Gay Marriage or Bombing Iran, which is going to cause some voters to be happy and some to be angry. And now you have to balance losing some support in certain states to gain support in others. Welcome to politics! *The details are pretty accurate. Once you get down into the minutia of what you are doing--all of the issues and demographics and data--you realize that the game is pretty close to real life. Regardless of how the election plays out, you'll find that, unless you're on the easier settings, Texas is going to go for the Republicans and California is going to the Democrats. There's obviously a lot more leeway in swing states--if you really wanted the GOP to win Vermont, you can, by spending an unrealistic amount of time there--but as a general rule the final maps look pretty realistic. I'm running on a platform of legalizing lawn darts. Sadly, you can't customize it that much. *Endorsement are still kind of wacky. They are first come, first serve, so players have to grab them as soon as possible so their rival doesn't. (And the computer AI will very much so grab them up quick.) Basically, you have to build a specific type of HQ to generate Clout, and Clout lets you purchase Endorsements...but once all the Endorsements are taken, those HQs are practically worthless. (They do provide a small awareness bonus, but it's certainly not worth the expense.) It just seems kind of useless to spend all your money at the beginning of the game, grab as many endorsements as you can as quick as you can, and then dump the HQs you just built. I realize that's how it plays out in real life, but it seems like another use for Clout could have been creates so that part of the game wasn't worthless after turn 10. It seems like there could be a better system. *Fundraising is kind of lame. It's easy--you just press "Fundraise" and money comes in--and the game makes the pretense that having high polls and awareness will bring in more cash. In reality, you go to California to fundraise. The "wealth" of a state determines, in part, how much you get, and California is so rich (in game terms) there's very little reason not to just tap it every time--all other factors combined will never make any other state bring in more than California. The more often you fundraise in a state the less it provides, but even at half rate California pulls in more cash than pretty much any other state. It's possible to tap into New York or Texas late in the game and grab more cash, but that's very rare. It doesn't break the game, it just seems like a missed opportunity. *The interviews are no-brainers. You are supposed to get a selection of responses based on your Intelligence, but it's always blatantly easy to pick the "correct" statement. A little more work could be put into this, I believe. As a side note, this is the third Political Machine game that Stardock has released--they've done 2004, 2008, and now 2012. There was a pretty big change between 2004 and 2008, but the move from 2008 to 2012 is very small. 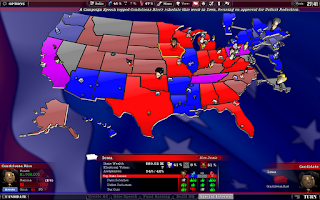 In fact, if you already own 2008, I'd be hard pressed to recommend 2012 to you--the issues have been updated, but the gameplay and 80% of the candidates are identical. Unless you have a burning desire to play Herman Cain or praise "Obamacare" instead of "Health Care," you are safe in not purchasing the game if you already have 2008. Overall, however, this is a good game that you're not going to pay a lot for. If you are in the least bit interested in the campaign this season--or really just want to not listen to the election coverage at all and run your fantasy scenarios in your head--it's really worth it.